Bigspeed Zip OCX is an ActiveX control that lets developers add zip compression functionality to any 32-bit Windows application. The component offers a wide variety of standard and advanced Zip file manipulation functions. On top of that, the library offers two unique features that cannot be found anywhere else. This multi-threaded, fully self-contained ActiveX control lets your applications handle zip files with ease. 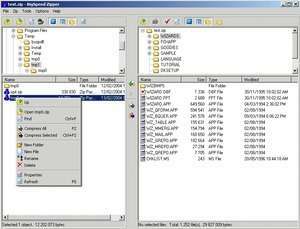 BigSpeed Zip OCX 3.0 is a shareware program and can be used as a demo to try the software until the free trial period has ended. A full version of the program is available after the trial period ends. For security reasons, you should also check out the BigSpeed Zip OCX download at LO4D.com which includes virus and malware tests. Additional screenshots of this application download may be available, too.